The Koorah was built in 1912 by Hall Russell for Brand & Co. Milford Haven. She first carried the registration M120 before being taken up for minesweeping in August 1914. By March 1915 she was heavily involved in the minesweeping effort for the Dardanelles campaign and distinguished herself, by saving under circumstances of great gallantry, the crew of the minesweeping trawler Manx Hero, which had been sunk in the Kephez minefield. Returned to fishing in 1919, she transferred to Grimsby owners registered as GY122, before going to Granton in 1935 as GN14. She was first registered in Aberdeen as A249 in 1941 under the joint ownership of the Walker & Regent Fishing Companies and was sold in 1944 to A&M Smith Ltd of Hull, becoming H77. 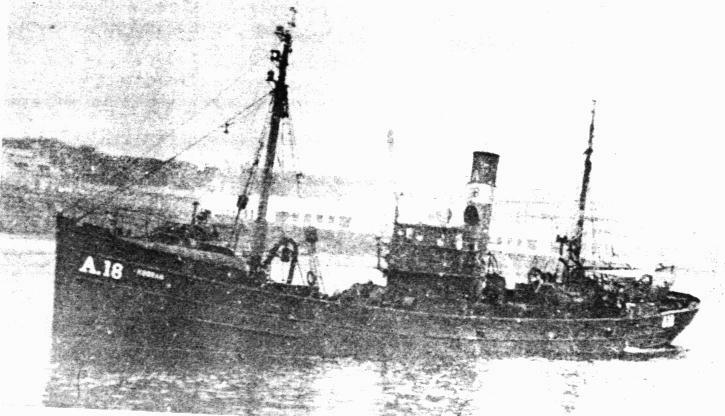 In 1946 she returned to Aberdeen under the ownership of the Brebner Fishing Co. Ltd and took the number A18. Her dimensions were 117' x 22'6" x 13' and she was 227 tons gross. On what proved to be her last trip, she had been fishing off Strathy point and was sheltering in the early morning in the lee of Dunnet Head awaiting daylight, when she ran ashore on a reef of rocks half a mile west of Dunnet Head at Sherrie Geo. In addition to firing distress rockets, a radio message was broadcast by skipper James Findlay and this was relayed to shore by the Jean Stephen, (herself lost four years later in Sinclair Bay), which was sheltering nearby in Thurso Bay. The twelve man crew had some difficulty in getting their smallboat into the water with the result that when the crew got into it they found it to be leaking copiously and had to bale continuously until they were able to board the Thurso seine netter Our Lassie, which brought them to Scrabster. Later in the day the Our Lassie brought the skipper and mate back to the Koorah and after inspection the remainder of the crew were brought to the ship to prepare for a salvage attempt. Despite the efforts of a salvage tug however it was impossible to move the vessel and she sank. She had a crew of 12 all from Aberdeen. Possible position 58 40 07N, 03 23 37W.